During the Great Depression, Esperanza is compelled to abandon her comfortable lifestyle in Mexico and enter into one filled with physical, emotional, social, and financial hardships and challenges in America. How does she cope and overcome? 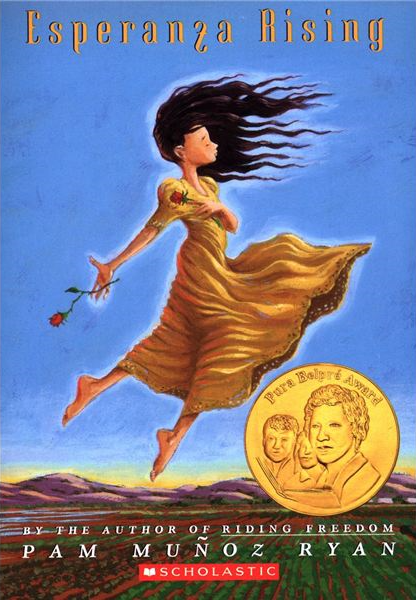 In case you haven’t already guessed, our January tween/ teen book club selection is Esperanza Rising by Pam Munoz Ryan. We’ve highlighted this book in the past, during National Hispanic American Heritage Month as a “highly recommended read.” Moreover, due to positive responses, we’ve decided to select it as our book club pick. This book is a fitting selection for January because it ties in so well with the general themes of a new year; themes that reflect new beginnings, fresh start, triumphs over trials, victory over obstacles, overcoming challenges, rising above, moving forward, leaving the past behind, etc. -themes of inspiration and aspiration you’re bound to find throughout the book. Hope you’ll enjoy reading this book with your tweens and teens. Let me leave you with a very profound proverb, reflecting one of the many great messages found in Esperanza Rising, “The rich person is richer when he becomes poor, than the poor person when he becomes rich.” Marinate on it as you dive into this inspiring read. Happy Reading! We would love to hear from you. What books are you reading this New Year? Please leave a comment or two below.